Welcomw to Barcelona and to "ACOMODIS" apartments! As many people ask, we confirm that IT'S NOT a shared apartment. IT IS a private apartment just for you. In order to give you accurate information and price about this or any of our apartments you can send as an e-mail and we’ll answer you. Also, if you want, we’ll let you know about our cooking activities. Below our picture ON THE RIGHT SIDE you will see the button to SEND A REQUEST for information and availability. *Price depending on the number of nights, number of guests and season. *If you contact us we will answer you with the total price. *If you are coming with children please let us know their age to know if you need baby cot and to recommend a family apartment. Renovated stylish 2 bedroom apartment right next to the historical center in Barcelona's l’Eixample. The apartment consists of 2 bedrooms with two single beds each and wardrobe. Beds can be together or separated. The lounge has a double sofa bed. Kitchen equipped with microwave, coffee maker, kettle, toaster and everything you need to cook and feel at home. There are small balconies typical of buildings of L'Eixample. Bathroom with shower. A hairdryer on request. The apartment is equipped with air conditioning and heating. The apartment is very quiet. It is a perfect place to rest, as it is very quiet. You will find free WiFi, TV and washing machine. This apartment is very practical couples, families and friends as it has everything you need to feel great during your stay in Barcelona. The neighbourhood is great because it has everything you need, including shops, supermarkets, tapas bars, restaurants, etc. 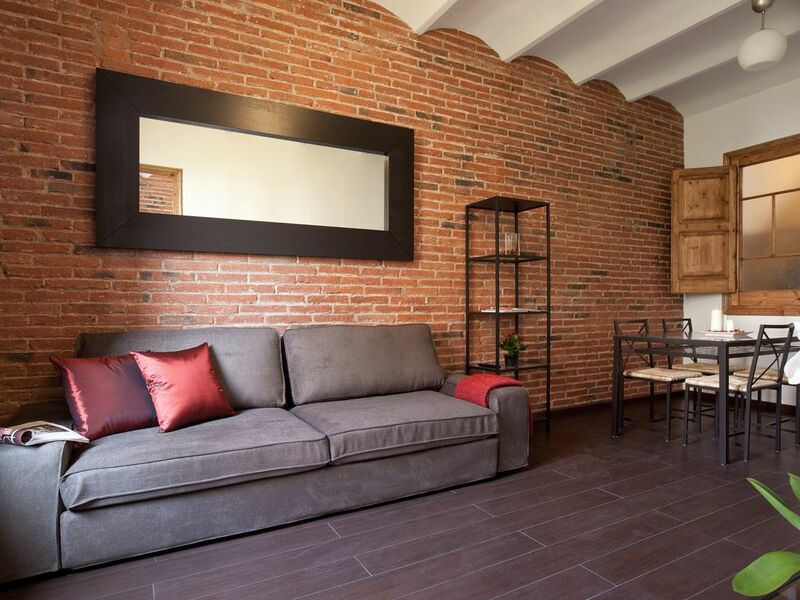 This beautiful apartment is located in the area of 'L’Eixample', which is very interesting. A walk around the area can feel like an inhabitant of the city! Nearby is the metro station and bus to travel around the city. Security deposit of 150 euros that we pay you back with your "check out". Late check in (20h-24h) has additional fee of 30 euros & (24h on) 50 euros. Arrivals on Sundays and holidays until 20h have a surcharge of 30 euros. Working in the hotel sector for over 3 years, I am in daily contact with all nationalities. Sharing my knowledge and learning from other cultures are driving forces for me. I love traveling, discovering new places and meeting new people. By welcoming you at home, you will feel like a true Barcelonese (e)! Barcelona is a very beautiful city! Superb apartment! The description of the rental and the situation is very precise. The photos are very representative of reality. The apartment is very clean and very well maintained. We like to be very accommodating and very kind to our visitors. The most important is not only that you stay in our apartment otherwise that when you return to Barcelona you would see to stay again in this apartment which is, ideally, ideally located. The subway / train line 'Passeig de Gracia' is 5 minutes walk from the airport. Everything is new since 2012 and everything is perfectly functional. With a quality / price ratio. . . It's worth the hiring! I highly recommend this apartment. It is located in a quiet location and there is a wide variety of restaurants nearby. It is a good starting point to visit the city of Barcelona. We have several apartments in the same building. The apartment was amazing. Well situated and well equipped - we made meals at home a couple of nights. The staff was easy to contact for check in and check out. We will be back for our next trip to Barcelona. A spacious and comfortable apartment. Everything was clean and well organized. The hosts was very friendly and helpful. My family and I really enjoyed our stay here. And Barcelona... well, an amazing city! We love it!! Lovely apartment. Our stay here made the trip to Barcelona even more fabulous. Also the attention of the host was wonderful. Everything is very nice and clean, great place. Thank you, it really was our pleasure to welcome you and we are happy to know you liked the apartment. We are delighted you enjoyed! Ein sehr netter und cooler Gastgeber! Das Appartement ist sehr zentral gelegen. Wir hatten alles, was wir brauchten und haben uns sehr wohl gefühlt. Es hat uns sehr gefreut, in so einer angenehmen Wohnung mit so entspannten Gastgebern übernachten zu können!!! The apartment was exactly what we were expecting, very close to everything. Our hosts were very accommodating and very helpful throughout our stay in the city. We would stay again in this apartment if we go back to Barcelona again. Thank you so much Amanda, we are delighted you enjoyed your stay in Barcelona and we are more than happy to know that you found what you expected. Thanks again! The apartment was terrific. It was perfectly located just a few blocks from Passeig Gracia as well as the Girona Metro and the Renfe Stop (to/from Aeroport). It was great that Mr. Duncan was able to meet us earlier than our designated time since our plane arrived earlier than expected. The balcony was convenient for us to hang out at night and enjoy a bottle of Sangria (for people watching below). I would definitely stay here again -- very convenient location and it was safe walking home at night. The only recommendation I would have is to have another air conditioner in the room towards the right (as you enter), the lone A/C in the main room wasn't enough to keep us cool at night. Renato, thank you so much for a wonderful review, we are so happy to know you enjoyed your stay and it was such a pleasure to host you and your lovely family. We really appreciate your great review, thanks again! Closest metro stations are: "Girona" (Yellow L4), "Tetuan" (Violet L2), "Urquinaona" and "Catalunya" (Red L1) which is a train station, too. The airport is 14 Km. DON'T HESITATE TO CONTACT FOR FURTHER INFORMATION! Traditional market "Mercat de la Boqueria". PRICE: IT DEPENDS ON THE NUMBER OF NIGHTS, NUMBER OF PEOPLE AND SEASON ACCORDING TO THE REGULAR CAPACITY OF THE APARTMENT IF YOU CONTACT US, WE WILL ANSWER YOU WITH THE TOTAL PRICE. TO BOOK THE APARTMENT THIS IS NOT NECESSARY TO PAY THE TOTAL AMOUNT IN ADVANCE. PRIX: CELA DÉPEND DU NOMBRE DE NUITS, NOMBRE DE PERSONNES ET SAISON SELON LA CAPACITÉ REGULIÈRE DE L'APPARTEMENT SI VOUS COMMUNIQUEZ AVEC NOUS, NOUS VOUS RÉPONDRONS AVEC LE PRIX TOTAL. POUR RÉSERVER L'APPARTEMENT CE N'EST PAS NECESSAIRE DE PAYER LE MONTANT TOTAL À L'AVANCE. Late check in of 30 euros for arrivals later than 20h and 50 euros for arrivals later than 24h. Arrivals on Sundays and holidays until 20h have a surcharge of 30 euros. Enregistrement tardif de 30 euros pour les arrivées après 20h et de 50 euros pour les arrivées après 24 heures. Les arrivées les dimanches et jours fériés jusqu'à 20h ont un supplément de 30 euros.